Point Yamu by COMO, the new resort from COMO Hotels and Resorts designed by Paola Navone, will open in November this year. 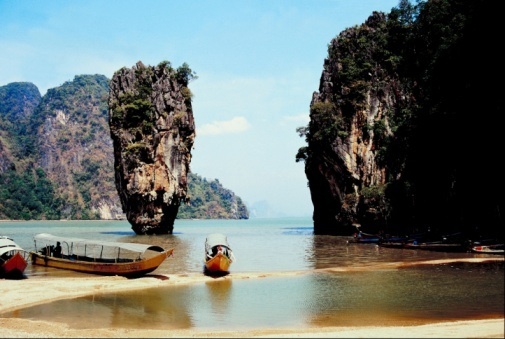 Point Yamu is located on Cape Yamu, a peaceful peninsula on the east side of Phuket. The resort overlooks the limestone karsts of Phang Nga Bay – a UNESCO World Heritage Site – and the Andaman Sea. The resort comprises 106 rooms and private villas, a 100m swimming pool, a COMO Shambhala Retreat with eight treatment rooms, including one beauty treatment room and yoga studio offering yoga, Pilates and Asian-inspired therapies, Italian and Thai restaurants and a child-friendly interactive learning area. Private residences with access to all Point Yamu’s facilities are also now available to purchase. Point Yamu is COMO’s first resort in Thailand outside Bangkok and it is also the first property designed for COMO Hotels and Resorts by Italian design talent Paola Navone (Navone is also working on COMO’s first Stateside hotel, Metropolitan by COMO, Miami Beach, set to open in December this year.) At Point Yamu, the collaboration sees COMO’s signature clean lines and pared-back, contemporary style united with the Italian designer’s eclectic, colourful approach and the use of local materials. Guests can expect a dazzling palette of bright aquamarines and hot oranges, with Thai artisanal techniques such as traditional wood tiling and woven rattan adding texture. The ocean-facing, floor-to-ceiling windows in each room, offers spectacular views of the turquoise waters of the Andaman Sea. Cuisine, prepared in a wood-fired oven also plays a star role at Point Yamu, with the resort offering a range of options, including relaxed Italian cooking and locally caught seafood at ‘La Sirena’, and spicy southern Thai cooking at ‘Nahmyaa’. Healthy COMO Shambhala Cuisine, designed to maximise energy and wellbeing, can be enjoyed at The Central Bar, while private dining such as beach picnics and romantic sunset meals can be arranged in-room and at a number of special locations in and near to the resort. Point Yamu’s COMO Shambhala Retreat is extensive, with a 100m swimming pool, yoga studio, a large gym and signature treatments such as the COMO Shambhala Massage and PURIFY holistic facial. For the more actively inclined, Point Yamu offers adventure with biking through nearby villages and plantations, snorkelling and diving off remote islands, all under the guidance of COMO’s expert, English-speaking guides. Families will also find much to do at Point Yamu, with plenty of interconnecting rooms and suites as well as a dedicated children’s play area with daily interactive games and activities. Family excursions can also be organized to include a visit to a Gibbons sanctuary, elephant rides and other exciting educational visits. Baby-sitting and childminding services are also available. At just 20 minutes by car from Phuket International Airport, Point Yamu will appeal to Asia-based couples and families seeking a short break to rejuvenate as well as long-haul guests looking for a comprehensive escape. It is also well located for combined stays with the Metropolitan by COMO, Bangkok. February 8, 2013 (Bangkok, TH) – Experts in ‘raw food,’ massage therapy and yoga will be on hand at COMO Shambhala Urban Escape throughout March as part of a dedicated ‘Wellness Month’ at Metropolitan by COMO, Bangkok. The schedule is open to both guests of the hotel, Bangkok residents and members of the spa. Raw food specialist Diana Von Cranach, and the renowned musculo-skeletal therapist Rohan Quarry Day, are among the experts who will be resident with us throughout the month. They will be delivering a packed schedule of classes and sessions that will help clients share in their knowledge and expertise. Experts in yoga (including facial yoga) and Pilates will also be running special classes during the month. Australian-born Rohan Quarry Day is the founder of Musculo-skeletal Deep Tissue Massage Therapy, a powerful combination of many different types of therapy, personally developed by Rohan after years of studying and working with a wide range of clients, to relieve symptoms of pain, stress and tiredness. His renowned hands-on healing therapy has won him a dedicated clientele all over the world, from stressed out executives to Olympic athletes. Rohan, a long-term collaborator with COMO Shambhala will be offering a number of one-to-one sessions at the Escape over selected dates. Yoga for Urbanites: Yoga expert Shane Cox will show you how to de-stress your life through yoga. Strengthening the Core through Pilates: This class is led by Pilates instructor Bell Suphatachaya Lattisophonkul. Face Yoga with Chatrisa Srisarntiwong: This half-day workshop will show you how to tighten tone and combat the signs of ageing. Metropolitan by COMO, Bangkok on South Sathorn Road enjoys close proximity to Bangkok’s urban nightlife as well as shopping and the city’s Sky Train. The 171 rooms and suites, defined by subtle contemporary design, offer cosseting luxury with attentive service. The Met Bar is a lively bar well known for its DJs and selection of martini cocktails. Australian chef David Thompson delivers award-winning Thai cooking at nahm restaurant whilst glow focuses on COMO Shambhala Cuisine—a nutritious, healthful menu. Relaxation is available at the hotel’s COMO Shambhala Urban Escape, comprising Asian-inspired treatments, a gym, yoga studio and 20m outdoor pool. Tuesday, September 11, 2012. (Singapore) – For the third year running, COMO Hotels and Resorts is teaming up with MasterCard to support development projects and charities across the globe. From October 1 to December 31, 2012, COMO guests can help local community projects raise US $30 everytime they pay for their stay using their MasterCard. MasterCard’s generous contribution builds upon COMO’s partnerships with grassroots organisations to support underserved communities and enable sustainable livelihoods. The MasterCard initiative applies across COMO’s nine luxury properties, this year including the newly-opened, Uma by COMO in Punakha, Bhutan. Each COMO property runs social and environmental programmes for staff and the local community throughout the year, focusing on projects and charities with immediate relevance to each location. COMO Hotels and Resorts and MasterCard have worked together for the Purchase with Purpose programme since 2010, enabling community investment of US$ 75,580 thus far. MasterCard’s corporate social responsibility platform (CSR) in Asia/Pacific, Middle East and Africa (APMEA) is focused primarily on bettering the quality of life for women and children. MasterCard does this by supporting a broad range of women’s and children’s causes through scholarships, financial assistance, educational and various sustainability programs, helping provide them with the skills required to stand on their own feet and support themselves and their families. This ultimately improves life and prospects within the communities that these empowered women live and work. Apart from the educational aspects of MasterCard’s CSR programs in APMEA, consumer education is an important area of focus for MasterCard given the significance of financial literacy in improving lives and the socioeconomic standing of families throughout the region. Image: Jorge Monje, former GM of Uma Paro, presenting a cheque to their community partner Kela Goemba, a nunnery in Bhutan. Last year’s program supported the reparation of a dormitory which was damaged in an earthquake. January 14, 2010. (Singapore)-COMO Hotels and Resorts, the award-winning five-star hotel group based in Singapore, is to develop and manage a new property on the Yamu peninsula of Phuket in Thailand. Located in Phang Nga Bay on the northeast coast of Phuket, this property is the ninth member of COMO’s family of unique destinations and is scheduled to open in September 2012. The key partners in this project are property development company Campbell Kane, the KS Group and Hotel Properties Limited. COMO’s multi-year management role encompasses full branding, sales, marketing and operational responsibilities. COMO is also playing key roles in the concept, development and execution of design and cuisine, to bring the signature COMO experience to guests. Located at the very headland of Yamu peninsula, the new property offers 129 rooms with panoramic views of the cape and the surrounding Andaman Sea. Guests can use the resort as a base to explore the dramatic limestone islands and calm turquoise waters of Phang Nga Bay. Just 20 minutes from Phuket International Airport, the hotel will be an attractive proposition for Asia-based guests looking for a short break to rejuvenate as well as long-haul guests seeking a comprehensive escape from city life. The new COMO resort will offer a 100-metre swimming pool, a COMO Shambhala Retreat with yoga studio, two restaurants and a private beach. Founded by Christina Ong, COMO Hotels and Resorts is known for its handpicked, intimate, and individually curated properties, including The Halkin in London, two Metropolitan hotels in London and Bangkok, Parrot Cay in the Turks and Caicos, Cocoa Island in the Maldives, and two Uma experience resorts in Bali and Bhutan. It also manages, in partnership with its sister brand in wellness, the COMO Shambhala Estate in Bali. COMO Hotels and Resorts are renowned for accurate and intuitive service, sympathetic and elegant design befitting each location, and outstanding cuisine, including the Michelin-starred Thai restaurant nahm in London and Bangkok, and the internationally-renowned Nobu restaurant in London. COMO Shambhala, its sister wellness brand, promotes health, relaxation and learning through its products, services, cuisine, treatments and spa facilities within each property. Urban Hotels: COMO Hotels and Resorts’ urban properties include the Halkin in London’s Belgravia, and the Metropolitan hotels in London and Bangkok. All three properties feature Michelin-starred chefs and a contemporary aesthetic and unobtrusive, Asian-style service. The lively Metropolitan hotels also house the world-famous Met Bars. Island Resorts: COMO’s private resorts offer powder-white beaches and some of the world’s best diving. The understated style and laid-back nature of Parrot Cay in the Turks and Caicos and Cocoa Island in the Maldives belie the exacting service that has become a COMO hallmark. World-class cuisine and comprehensive wellness treatments and activities at COMO Shambhala Retreats complete COMO’s approach to a perfect beach holiday. The new Phuket property is the latest addition within this category of COMO properties. Adventure Retreats: The Uma properties in Paro in Bhutan and Ubud in Bali unveil local culture, nature, and religious and folkloric traditions. Specialist guiding, treks and tours, physical activities and tailor-made programmes ensure memorable insights into some of the world’s most unique locations. Intimate and relaxed, the Uma properties reference local design and cuisine while providing an unmistakeably COMO experience. Wellness Resorts: COMO Shambhala Estate in Bali is a sanctuary for holistic wellness. Expert staff are goal-oriented, relevant and realistic in their consultative approach. Each guest’s individual needs and ambitions determine the programme of nutrition, exercise, therapies and activities. Facilities and tropical villa-style accommodation are impeccably appointed.